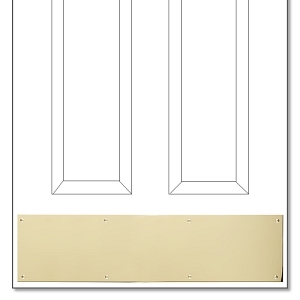 Polished Brass Kick Plates are available in 6" x 8" heights and several widths. You can also choose from screw mount, magnetic mount and adhesive mount. Please double check the width you order to make sure you get the right kick plate. 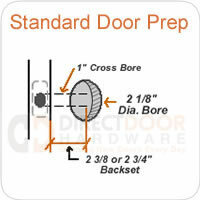 Generally you will want to order a kickplate that is 2" shorter than your door width so that it doesn't get in the way of your door trim and weatherstripping. So if you have a 36" door for example, you'll want to order a 34" wide kickplate. Many kickplates are custom made to order in the finish you need. Some standard sizes are in stock, but please allow 2-3 weeks before shipment. Polished Brass screw mounted kick plates are easy to install. Check out our kickplate installation page for more information. Looks great! Only minutes to install. The quality of the product seems excellent. The two plates were in perfect condition when received. Installation was easy. I love the brass kickplate on my front door, it was exactly what I wanted, no screws only magnetic, easy to instasll, the brass looks fantastic on my red door. Thanks, Mrs DULEY. This was a very nice plate to put on our front door. It was the exact size we needed. The brass plate was delivered promptly and the installation was a snap. Thank you. Love the brass kickplates. They match the doors hardware and dress up our new sunroom addition. Contractors were very impressed because no holes had to be drilled in the steel doors. After completing a simple ordering process, my brass kickplate arrived promptly, well packaged with all needed parts, installed easily, and added the touch of elegance that I had hoped for! A wonderful product. No muss----no fuss installation on my metal front door. Adds elegance to my entrance. Does the high polished brass have a lacquer finish to maintain the shine without having to recurrently polish it? Thanks. If you choose the polished brass PVD finish designed for exterior use you will not have to polish it.